Tony Lawrence's Coins & Stuff: Why did we make Trade Dollars? Trade Dollars are a strange coin indeed. They have a long history (see http://en.wikipedia.org/wiki/Trade_coin) as these are coins that were readily accepted by other countries - hence the term "trade". Sometimes these coins were simply ordinary circulating coins that became commonly used for world trade. The Mexican Peso and the Austrian Thaler were examples. But Britain and Japan and the United States issued coins specifically designed for that purpose. Our trade dollars were also a solution to a glut of silver bullion. We had stopped producing silver dollars in 1873, but silver production was increasing even as world demand for bullion decreased. I suggest reading U.S. TRADE DOLLARS 1873-1885 for details, but the upshot was that we needed to export more silver but could not. 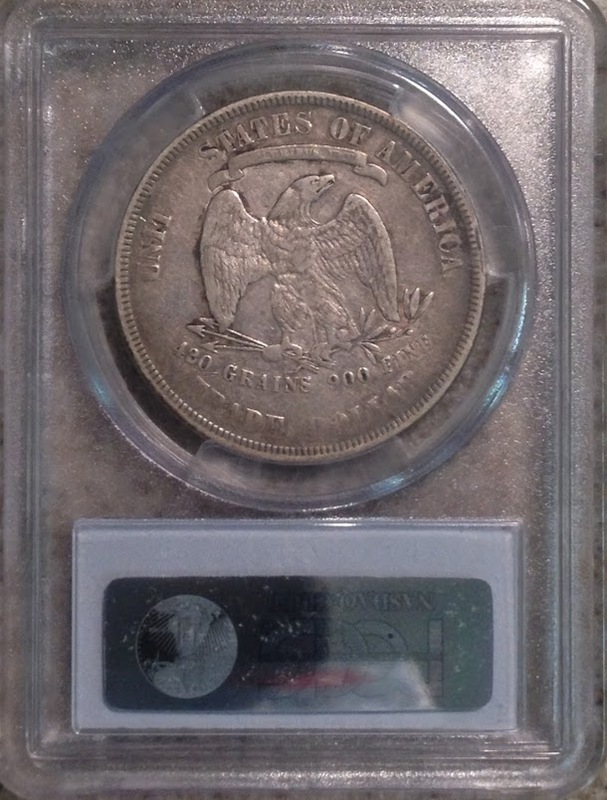 Trade Dollars were the solution, at least until we started minting Morgans in 1878. 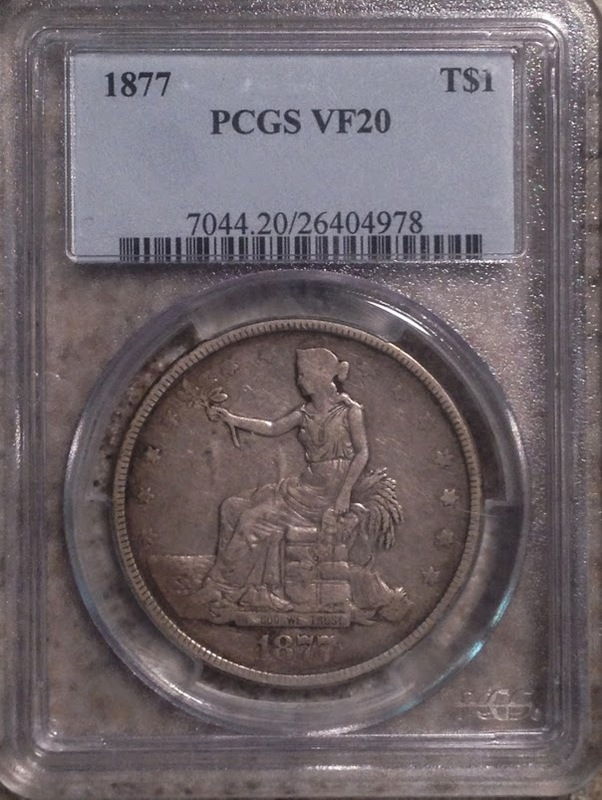 The U.S. Trade Dollar was 420 grains, slightly heavier than than the Liberty Seated Dollar (which wasn't circulating anyway) and proudly marked to show that. The reverse design is reminiscent of the Mexican peso and the obverse is not dissimilar to Britannia on English coins - no doubt that these choices were deliberate to smooth acceptance. Southern China accepted the coin officially in November of 1873. So, if you were in possession of silver bullion that had no good market, you could bring it to one of our Mints and exchange it for shiny new Trade Dollars. Load those onto a clipper ship heading for China and months later you'd have silk, spices or whatever other goods you had purchased in China. This was a good deal for the silver producers, but it was also good for trade. Northern China did not accept the Trade Dollar. We started having problems at home, too, as the value of silver continued to drop. People could trade cheaply bought silver for Trade Dollars and use those dollars here in the United States. However, nobody wanted them, so the typical use was to foist them off as wages on workers who then had a hard time spending them at full value. That finally led to the total stop of the minting of Trade Dollars. From a numismatic point of view, it is ironic that China is now the source of many counterfeit Trade Dollars. Some are very easy to detect, but some are better made. Here are some links that you may find helpful. How do you spot fake Trade Dollars?